If you’re looking to buy DekoRRa rocks and products on-line there are a few things to consider first. What Are You Using The DekoRRa Rocks For? 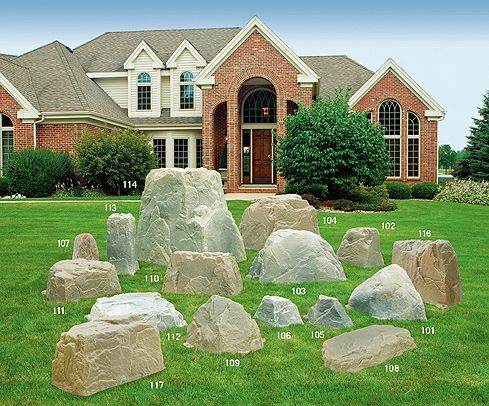 DekoRRa Mock Rocks are available in a wide variety of shapes and sizes ranging from small fake rock covers to large boulders. If you intend to use them as landscaping accents be sure to measure the areas where the rocks will be placed and select models that will fit in those spaces without crowding nearby shrubs, flowers, and bushes. Pay attention to the exterior dimensions at the very base of each rock model. Also note the overall height. Consider how tall plants in front of the rock will be. Taller rocks can be seen from a greater distance than shorter models. Several of the DekoRRa rocks function exceptionally well as house address number or name rocks. Personalized plaques of different shapes, sizes, and colors are mounted to the rock with stainless steel hardware, resulting in a beautiful house address monument that is highly weather resistant. At RocksFast.com it’s as easy as choosing a house address rock model, entering your desired text and selecting the rock and plaque text color. The address plaques are fastened to the DekoRRa rocks before shipping. Just open the box and place the house address rock in the yard, entryway, adjacent to a walkway or out in a landscaped area for a healthy serving of curb appeal. DekoRRa rocks can be used practically anywhere a fake prop rock is needed. We’ve seen them used in high school musicals, church productions, on floats in parades, in movies and television shows, at trade shows, museums, and more. The ultra-realistic and light weight design makes DekoRRa rocks easy to work with and super durable to with stand damage. Making fake prop rocks is time consuming and messy. Concrete, spray foam and other methods can be a huge headache for production and set designers. DekoRRa makes choosing the perfect prop rocks super fast and easy. Probably the most popular use for DekoRRa rocks is to disguise utilitys in yard and garden areas. From an aesthetic point of view, septic tanks, wells, electrical boxes, irrigation valves and the like can be real eyesores. Hiding them with easy to use DekoRRa rocks is a fast solution many home owners take advantage of. Sensitive water wells and irrigation valves can be prone to freeze and frost damage during cold months. Many homeowners choose to protect these expensive utilities with DekoRRa rocks to add insulation and help prevent costly damage from the weather and tampering or theft. In order to select the correct size rock model to fit your application, it’s important to look at the amount of interior space available inside of each model. Interior space lessens with height, so the taller the object is that is being covered, the larger the rock or boulder will need to be. DekoRRa also manufactures a line of USA made backflow and well insulation bags. These R-10 insulation bags are designed to slip over and provide frost protection in cold weather. The backflow insulation bags are available in several popular backflow configuration sizes, and the water well tank insulation bags are also available in a variety of sizes. Electric heat options are also available if 24 hour freeze protection is required. DekoRRa backflow protection enclosures incorporate both the insulation bags and electric heat tape in the ASSE Class 2 and Class 1 configurations. DekoRRa rocks and products are designed to be extremely high quality, easy to use, and weather resistant in any climate. In a world where everything seems to be made from cheaper and cheaper quality materials, it’s refreshing to see a company like DekoRRa working against the grain.